The Mount of Olives is a holy site, one with tremendous meaning for readers of the New Testament as well as the old. From the Mount of Olives Jesus gave his famous "Olivet Discourse" so often read, spoken of and preached about to this very day. From the Mount of Olives Jesus wept over Jerusalem's rebellion against God, knowing what was in store for her. From the Garden of Gethsemane, at the base of the Mount of Olives, Jesus wept tears of blood and was strengthened by an angel as he was praying the night before his crucifixion. From the Mount of Olives, our resurrected Lord ascended into heaven in view of both men and angels. The destruction now occurring at the Mount of Olives demonstrates how much Satan hates the Messiah, how desperately he seethes at the very notion of resurrection, and being evil incarnate, will do anything to destroy that which is holy. -W.E. While Israel battles a horrific wave of Arab terror that has literally caused blood to flow in the streets, a lesser-known side of their jihad is going unseen: the Arab war against Jewish graves. Though less brutal than murder, Arab desecration of Jewish graves is a part of the same war that will not only establish whose land it is, but will also determine the nature of the coming Messiah.One of the main targets for Arab vandalism is the Mount of Olives and the thousands of Jewish gravesites located there. 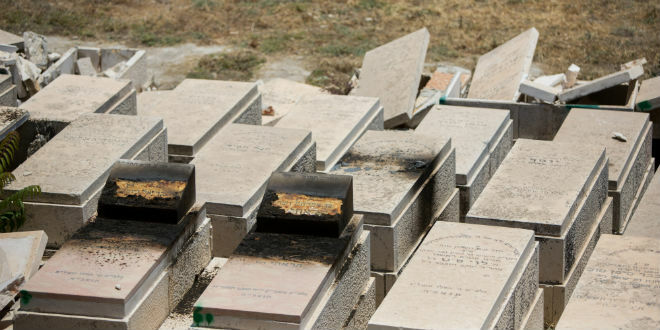 Gravestones are destroyed and mourners are attacked on a daily basis, requiring special security details to accompany Jews who visit the site.